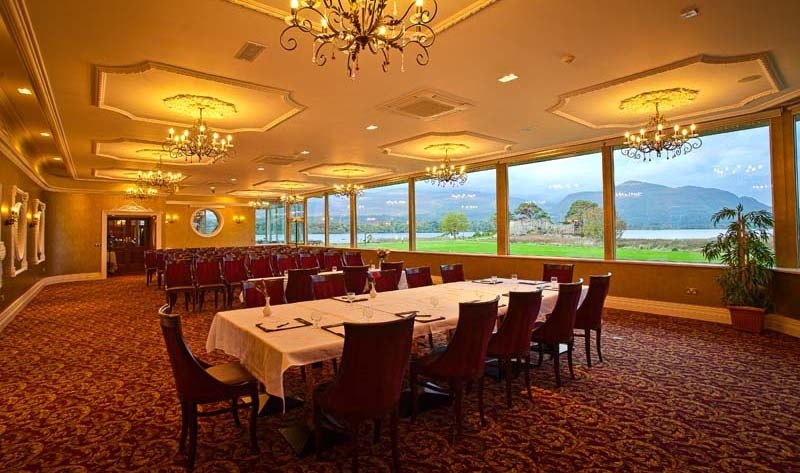 The Castle Suite at The Lake Hotel is an impressive private dining and meeting room which enjoys the magnificent lake and mountain views. This large, bright and airy room also offers the opportunity to wander out onto the hotel lawn when the Irish weather permits! The Castle Suite can seat up to 80 for dining and can cater for up to 150 for a cocktail reception style event. The Lough Lein Room is a lovely tranquil room close to the hotel bar and Reception area and looking out onto the woodland to the front of the hotel. This peaceful room with its warming fire and bay window, decorated in soft yellow and gold tones is a perfect venue for more informal events such as cocktails, canapés, finger food or our hand-held dining menu. We are happy to create menus especially, to celebrate an occasion. Special dietary requirements are catered for as much as possible, advance notice is helpful. If you wish to inquire about using The Castle Suite or The Lough Lein Room for an event, please email or call us with your event requirements and we will be happy to help you.